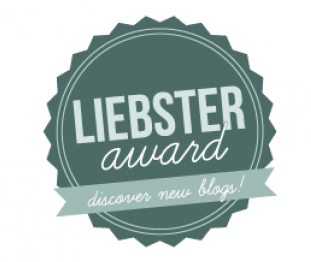 “The Lost Art Of Feeding Kids” by Jeannie Marshall. I have been looking for reading some interesting and relaxing book for a while. I am always interested in nutrition, healthy eating, super foods and so on, so this topic is always on the first place for me. When I am checking the books at the book store or at the library the first section I will look at is Healthy Habits, Eating. When I saw the title of this book on the shelf the other day, I said to myself: ” This books is for me. I need to read it.” There are so many healthy eating books on the market, but 60% of them are boring, keep writing the same information, and makes you bored after 2 minutes reading it. 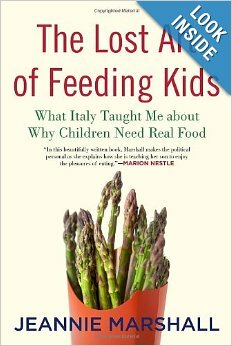 So I was expecting a lot from ” The lost art of Feeding Kids”, and this book didn’t make me disappointed at all. The thoughts of the author is so close to me, because I was grown up in the same environment, so I could easily understand what she was talking about. My memories from the childhood are visits to farmers market every other day, especially in summer, homemade food and the fresh healthy food on the table. We’ve never had any frozen foods in our stores besides frozen fruits, we ate by season, no strawberries or watermelon in winter and we were much more healthier than the new generation now. I remember myself craving the fresh cucumbers by the end of winter and my mom didn’t buy them in March or April explaining us they have a lot of pesticides in them and we should wait by summer time to eat the real fresh cucumbers. This was about all the foods: tomatoes, strawberries, watermelons, peaches. You need to wait for the season, when they are real and ripe and ready to eat. The author takes us to Italy, so it was even more interesting for me to read the book because I like Italy and all about it. Packaged snacks and junk foods are displacing natural, home-cooked meals throughout the world—even in Italy, a place we tend to associate with a healthy Mediterranean diet. Italian children traditionally sat at the table with the adults and ate everything from anchovies to artichokes. Parents passed a love of seasonal, regional foods down to their children, and this generational appreciation of good food turned Italy into the world culinary capital we’ve come to know today. When Jeannie Marshall moved from Canada to Rome, she found the healthy food culture she expected. However, she was also amazed to find processed foods aggressively advertised and junk food on every corner. While determined to raise her son on a traditional Italian diet, Marshall sets out to discover how even a food tradition as entrenched as Italy’s can be greatly eroded or even lost in a single generation. She takes readers on a journey through the processed-food and marketing industries that are re-manufacturing our children’s diets, while also celebrating the pleasures of real food as she walks us through Roman street markets, gathering local ingredients from farmers and butchers. At once an exploration of the US food industry’s global reach and a story of finding the best way to feed her child, The Lost Art of Feeding Kids examines not only the role that big food companies play in forming children’s tastes, and the impact that has on their health, but also how parents and communities can push back to create a culture that puts our kids’ health and happiness ahead of the interests of the food industry. 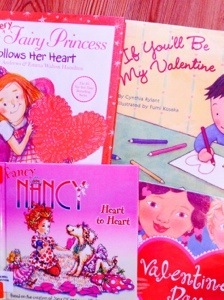 Valentine’s Day books for kids. We love books in our house. I started reding to my daughter when she was 3 weeks old, and from that time it’s her favorite thing to do. PreS-K-Gerry is all about celebrating Valentine’s Day. It’s one of her favorite days, and she prepares and prepares for it. She makes valentines for everybody in her family and all of her classmates. When the big day finally arrives, her parents help her celebrate with pancakes, complete with fairy dust, a tiara, and wings. She arrives at school looking forward to the class party, but then realizes that she left her valentines at home. What could be a huge disaster turns into a unique opportunity for Gerry to show her friends just how much they mean to her by acting out her valentines for them, telling them why they are special. It turns out to be a great day for everyone. 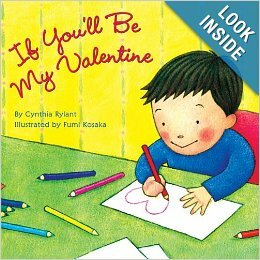 For Valentine’s Day everyone is making valentines to send to Michiko in Japan. Eveline decorates her card with gold glitter. pablo draws a picture of a happy fish. The kids in Mrs. Madoff’s class remember all the things they liked to do with their friend Michiko, even though she’s thousands of miles away now. 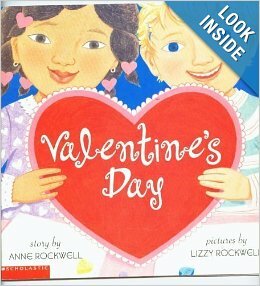 PreS – A little boy creates and presents valentines to his pets, family members, and even his teddy bear in this appealing picture book. Told entirely in rhyme, the story commemorates kindness as well as love: the child reads a book to a younger brother and sends an affectionate note to his grandmother. 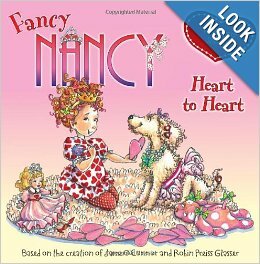 Share what are your favorite Valentine’s Books and what you read to your kids!!!! I started reading to my daughter when she was 1 week old. I guess she didn’t understand anything but it definitely made her love the books. I guess her favorite activity is Reading Books. She can do it all day long. It’s very important to read to your kids from the early age. Why Read to My Baby? You may wonder about the benefits of reading to your baby. An infant won’t understand everything you’re doing or why. But you wouldn’t wait until your child could understand what you were saying before you started speaking to him or her, right? Nor would you bypass lullabies until your baby could carry a tune or wait until he or she could shake a rattle before you offered any toys. Reading aloud to your baby is a wonderful shared activity you can continue for years to come — and it’s an important form of stimulation. Believe it or not, by the time babies reach their first birthday they will have learned all the sounds needed to speak their native language. The more stories you read aloud, the more words your child will be exposed to and the better he or she will be able to talk. Hearing words helps to build a rich network of words in a baby’s brain. Kids whose parents frequently talk/read to them know more words by age 2 than children who have not been read to. And kids who are read to during their early years are more likely to learn to read at the right time. When you read, your child hears you using many different emotions and expressive sounds, which fosters social and emotional development. Reading also invites your baby to look, point, touch, and answer questions — all of which promote social development and thinking skills. And your baby improves language skills by imitating sounds, recognizing pictures, and learning words. But perhaps the most important reason to read aloud is that it makes a connection between the things your baby loves the most — your voice and closeness to you — and books. Spending time reading to your baby shows that reading is a skill worth learning. And, if infants and children are read to often with joy, excitement, and closeness, they begin to associate books with happiness — and budding readers are created. We have a lot of books at home, but we also go to the library every week, and I let my daughter to pick the books that she likes. When she wasn’t even 1, we found the amazing magazine for babies: Babybug. BABYBUG is for babies who love to be read to and for the adults who love to read to them. 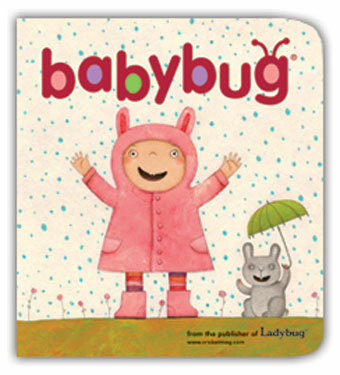 Full of the highest-quality content available from the world’s best children’s writers and artists, Babybug has delighted little ones since 1994. The joyful, brightly-illustrated stories and poems are perfect for parents and grandparents to read aloud, while the extra-heavy pages, non-toxic ink, rounded corners, and staple-free binding make BABYBUG safe for little ones to explore on their own. 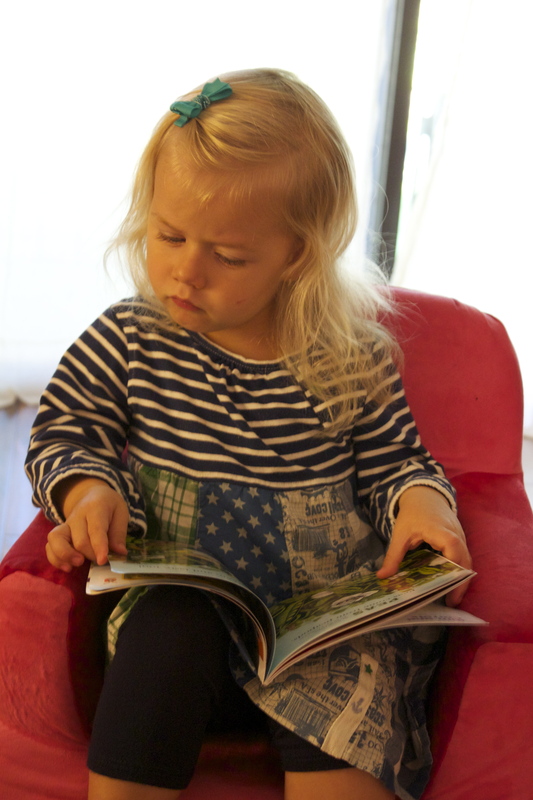 The different stories and poems in the magazine make it interesting and challenging for the little ones, because they always want to hear and learn something new. Every magazine starts with the story about the everyday life of the little boy Kim and his stuffed bunny Carrots. 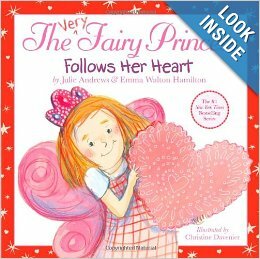 After that you have 3-4 little rhymes and stories with the pretty colorful illustrations. At the end you have the section “Let’s explore” which let the little ones learn more about the world. A “Guide for Caregivers” on the last page offers read-aloud tips and child development insights to help you get the most out of each issue. The magazine is 33.95$ for a year, but you can always find the different promotions on line, and save almost 50% off for subsciption. We personally borrow it at the library. Although my daughter is almost three, she still loves BABYBUG. There is something special about this magazine, because little kids just adore it. I remember myself deciding what should I feed my baby. Do I make baby food by myself or just go to the store and buy organic baby food there? My choice was obvious. I decided to do it by myself. 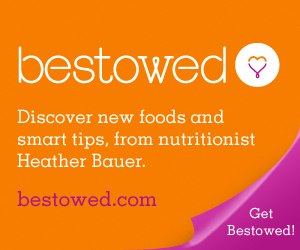 The baby food is very easy to make, but you need some ideas and recipes for it. You can search the internet, find the recipes, but it might take you more time as you expect. 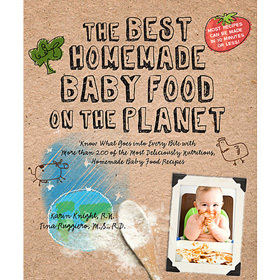 I got the baby food book that helped me a lot: The Best Homemade Baby Food On The Planet. The Best Homemade Baby Food on the Planet is the single most comprehensive baby food book available today.Written by two highly-respected experts, the book contains more than 200 delicious, wholesome and natural baby food recipes along with guidance that takes the guesswork out of cooking for baby. It’s a must-have for moms, dads and grandparents alike! Each recipe is simple to make and doesn’t require complicated steps or expensive ingredients. Most recipes can be made in 10 minutes or less! The book also provides information about what foods are safe to introduce to baby from weaning to two years of age. From baby’s first purées to meals for the active toddler, the recipes and suggestions in The Best Homemade Baby Food on the Planet pave the way for your child to enjoy a lifetime of good health! I tried many recipes from the book and they worked great. I really liked the chapter about the Best early Nutrition for you little ones at the end of the book. The guide to Vitamins is fantastic. It explains every vitamin in details, what it does, source of it for every age. If you are deciding what to feed your baby now, I would highly recommend to read this book. 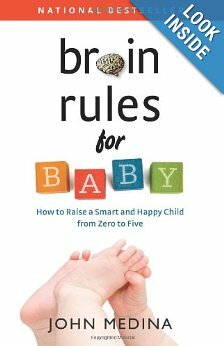 Brain Rules For Baby:How to Raise a Smart and Happy Child from 0 to 5. I read this book more than a year ago, and find it very useful and helpful for the parents. There are a lot of different information, how to make your kid smart, starting from the birth. The thing that I like the author said, that of course new mom nutrition, behavior play a huge role in developing baby even when it is still in your womb, but the things like listening classic music, putting special mashines on your belly with music do not help or develop your future child”s brain. There are a lot of different educational videos, that you can use from the birth, and the commerce says:”Make your baby speak Chinese in 12 months”. This doesn’t have any sense too, because there is no official scientist conclusion about videos which make your kids genious. The author reccomends to avoid TV by age 2, and even after that try to make your kids life interesting with the books, people, different performances, activities etc. A lot of people don’t agree with this, and in real life it is much more difficult to keep a child away from electronic devices, but I think we always try to pick easier way in everything, for example: Of course, its easier to turn the tv on for your kids, than make up a game for them and play with them. And noone say do not use the tv or computer at all, but it should be like a prize, like something special for them, something they should merit. Instead of using electronic devises with no control, you should learn your kids to make up new friends, learn to make new games and entertain yourself, make yourself busy with interesting things. Babies develop an active mental life in the womb. Eat right, stay fit, get lots of pedicure. The brain seeks safety above all. What is obvious to you is obvious to you. The brain cares about survival before learning. Face time, no screen time. Babies are born with their own temperament. Emotions are just Post-it notes. Labeling emotions calms big feelings. Babies are born with moral sensibilities. Let your yes be yes and your no be no. So this book is pretty interesting and probably someone who is interested in babies, their development and bringing up kids would like it. Few weeks ago I found out that you can borrow ebooks from your local library now. It is an amazing thing,because you don’t need to go to the library to pick the book and you don’t need to go back to return it. The best thing, when you book expires, they just take it back from your account, and you don’t have to remember the return date of it. For doing it you suppose to have a library card and download OverDrive from Apple Store. After the application is loaded you just go on line, to your local library site, borrow the book and enjoy reading it on your computer, iphone or ipad. They have the newest books available which is not always possible for the paper ones, and you can read it anywhere. Perfect for busy people, because it is not easy to find time to sit and read a book sometimes, but having the book available on you device, let you read it anytime. Some libraries also have the direction how to use the ebooks borrowing for different types of devices, so it’s very easy and convenient. I personally like to read paper books, but with lack of time, this thing saves my life. I will be able to find time to read books again now.